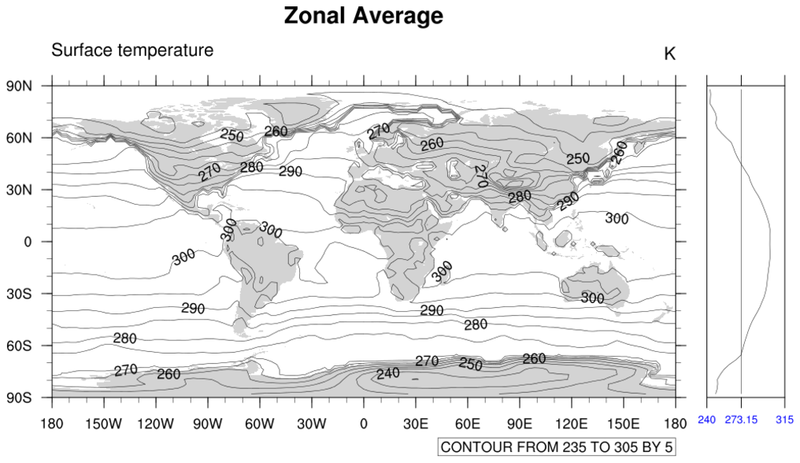 This page shows how to create various types of zonal average plots. zonal_1.ncl: The simplest. Reads in data and then creates a default zonal means plot. dim_avg averages the right most dimension of a variable. 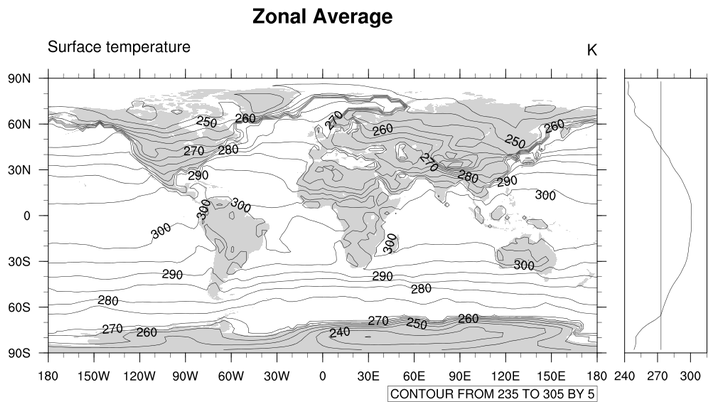 So, for TS(time,lat,lon), the lon dimension is averaged which results in a zonal average. This example used dim_avg_Wrap which preserves meta data. 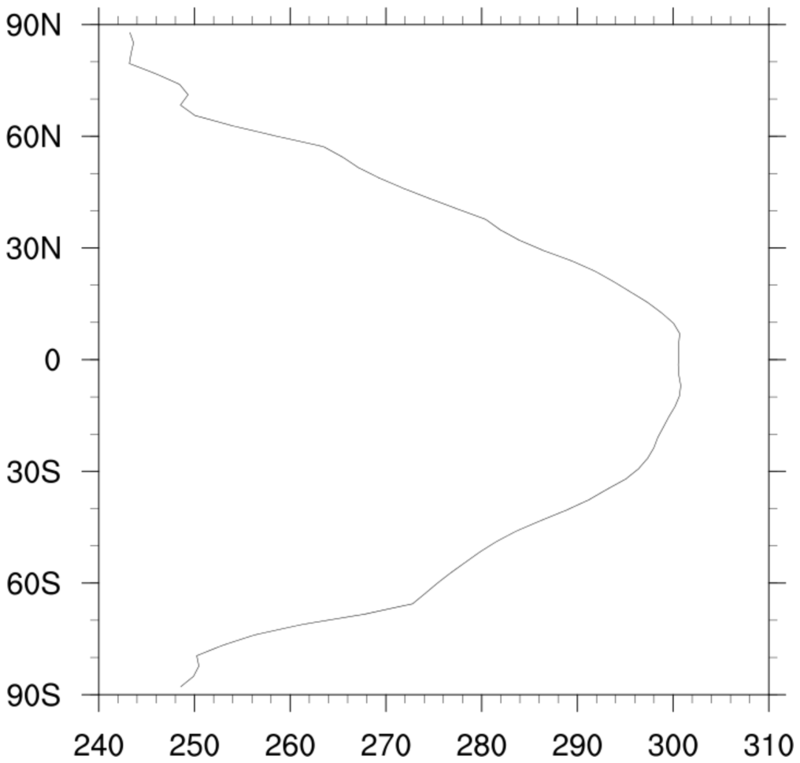 zonal_3.ncl: Add zonal average to a cylindrical equidistant plot. 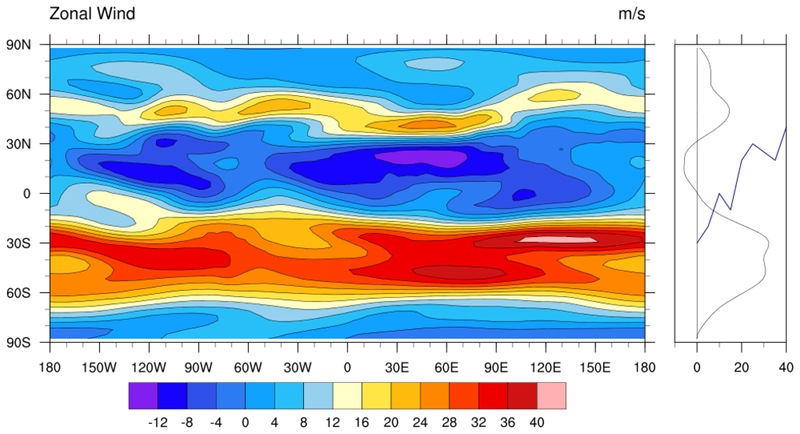 gsnZonalMean turns on the zonal average. zonal_5.ncl: Transforms plot so that the eta axis is evenly spaced. gsnYAxisIrregular2Linear = True, transforms the irregular eta axis to a regular axis. 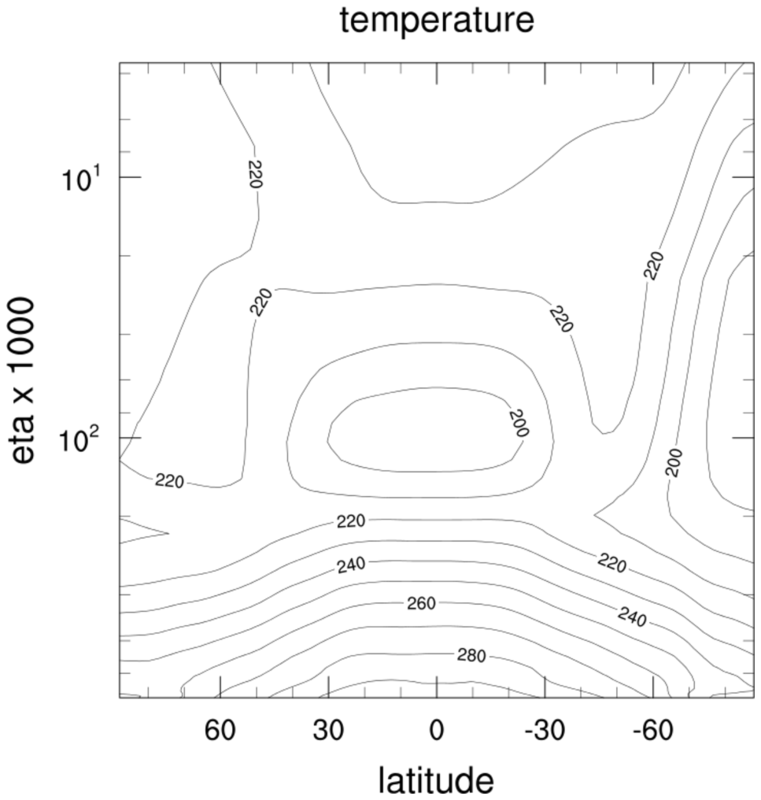 zonal_6.ncl: Changes Y-axis to log scale. gsnYAxisIrregular2Log = True, Changes the y-axis to log scale when the original axis is irregular e.g. eta. If the y-axis is regular e.g. levels, then trYLog = True, should be used to set the y-axis to log scale. zonal_7.ncl: This example is similar to example #3, except instead of setting a resource to create a zonal means plot, gsn_csm_attach_zonal_means is used to create and attach the plot separately. 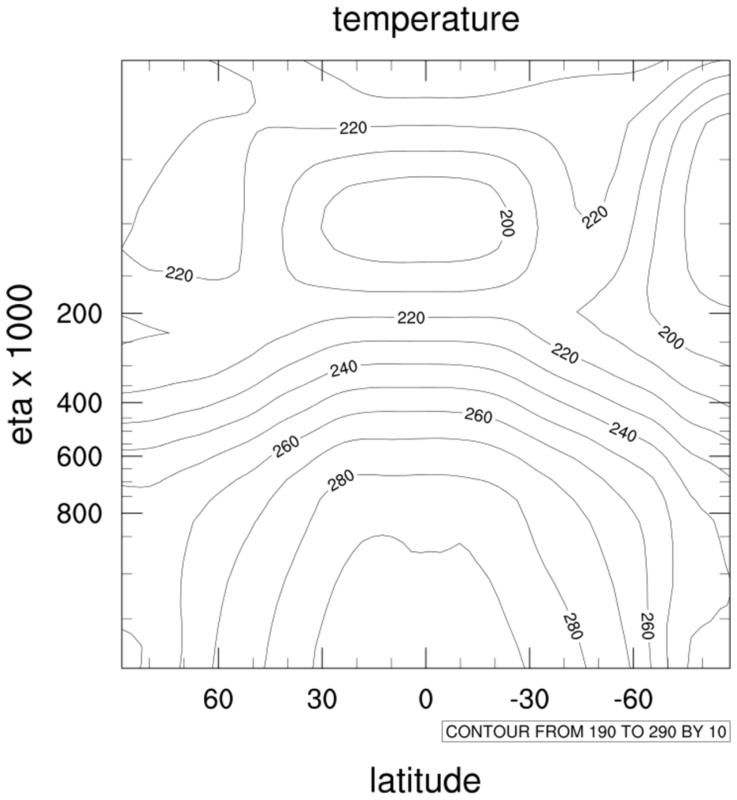 Using this gives you more control over the look of the zonal means plot. The tickmark resources tmXBMode, tmXBValues, and tmXBLabels are set to explicitly label the X axis of a zonal means plot, and other resources are set to change the size and color of the X axis labels. 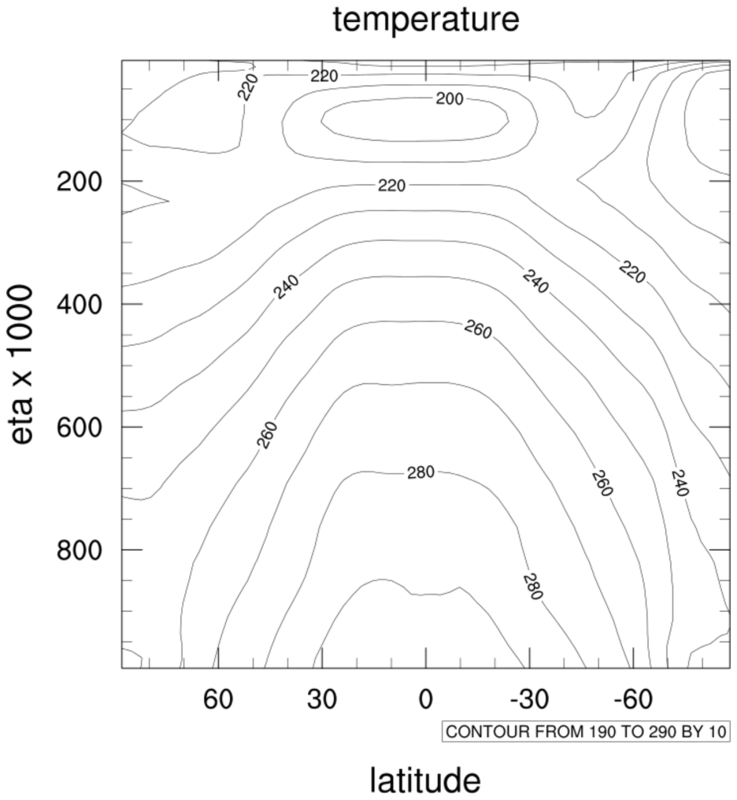 zonal_8.ncl: This example is similar to example #3, with an additional dummy curve added to the zonal means plot. The special create block is used to create a new data object containing the new curve to add. 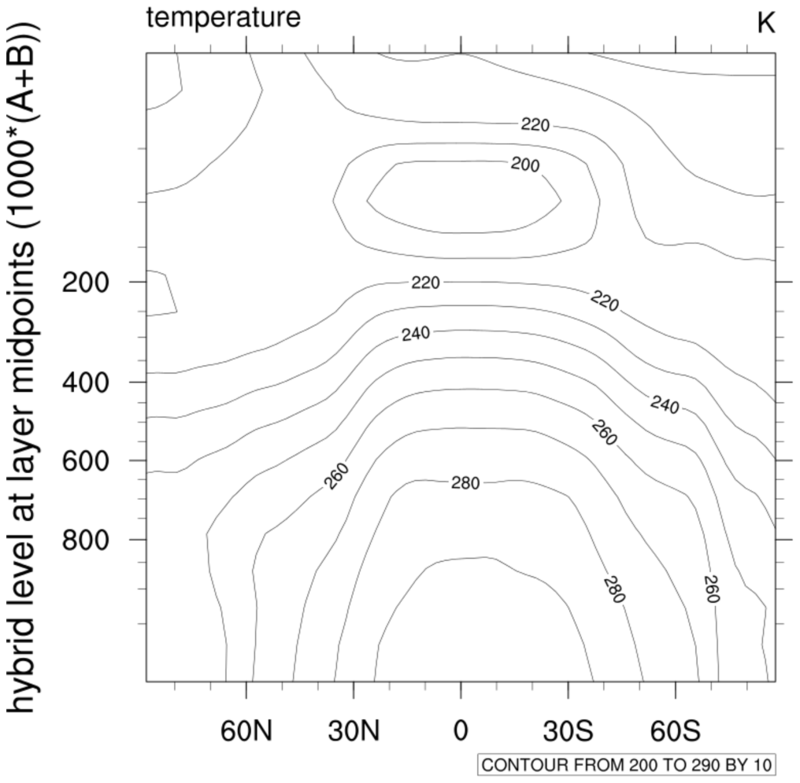 The NhlAddData function is used to add the dummy curve to the zonal means plot. The "setvalues" block is used to further customize the curve. After the curve has been added, call the plot to draw everything. Note: you can also add the additional line using gsn_add_polyline. This particular example was done this way to show another variation. Also, when you use NhlAddData, you can continue to use xy resources to customize the curve. Thirdly, any new curves added will be recognized by the automatical legend generator, if you set pmLegendDisplayMode to "Always".